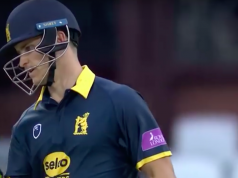 Warwickshire opening batsman Dom Sibley started the 2019 season in fine style with an impressive hundred against his old county, Surrey for MCC in the curtain-raiser fixture at Abu Dhabi. Fresh from this success, Sibley spoke to Deep Extra Cover’s Terry Wright. “Since I came here to Edgbaston, all the lads have been great and the coaching staff have been really good. The move from Surrey in 2017 has given a new impetus to Dom Sibley’s career. It is all of six seasons ago that he became the youngest player to make a double century in the County Championship. Aged 18 years and 21 days, he scored 242 against Yorkshire at the Oval. In subsequent seasons, there were highs and lows as might be expected of a young player seeking to establish himself in the game. So when he chose to leave Surrey, the jury was still out as to whether that early promise would be fulfilled. Doubts remained when he struggled with the bat against Second Division bowling early last season, but then everything came right for the right-handed opener. 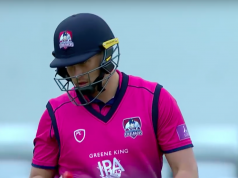 He and fellow import Will Rhodes averaged over 90 for their opening stands in the second half of the season, and Sibley ended with three hundreds in consecutive matches. Sibley is very clear about the importance of his batting partnership with Will Rhodes. “Will and I complement each other at the crease,” Sibley said, “He’s left-handed and I’m right, and he scores in different areas to me. When we’re both playing well and rotating the strike, we can be quite difficult to bowl to. “When it didn’t go so well early on last year, that was my fault because Will was doing OK. I wasn’t really sure where my game was at the start of the season. There were other special experiences last year. 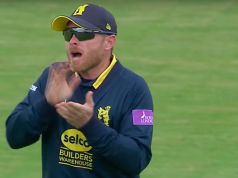 Warwickshire recognised Sibley’s leadership potential by appointing him last year as vice-captain to Jeetan Patel, ahead of more experienced players such as Bell and Trott. “At times last year, when I was struggling for runs, it was difficult. Last year, Sibley played mainly four-day cricket; but his ambitions are wider. Talk of white ball cricket takes us on to Sibley’s bowling. For a year or so, he has been experimenting with the tricky art of leg spin. With the departure of Josh Poysden to Yorkshire, could this open the door to Sibley the bowler? “Yes. I want to be an option that Jeets can trust so, given the chance, I hope it will come out all right. Looking ahead to the coming season, Sibley is pretty clear as to his priority. Time will tell just how far Dom Sibley can go as a cricketer. At the start of a new season, it is clear that his move from Surrey to Warwickshire has given his career the boost that it needed and that, right now, he is extremely happy to be a Bear.